Reading through two interesting articles recently in the Daily Mirror on the National Archives Department, I remembered the days when I used to drop in to refer to old newspapers and other Government publications. My first visit was in 1959 when the department was in the cool climes of Nuwara Eliya. That was to look for a few Dinamina editorials for use in the paper’s 50th anniversary issue. After the office was brought down to Colombo once air-conditioned facilities were available, it was so convenient to walk in and do reference work. My last visit was on the day the National Film, Television and Sound Archive was launched on Lester James Peries’ 95th birthday. That was four years ago. It was a dream come true for LJP who had been agitating for a film archive for several decades. Old memories came back as I walked past the panels with scenes from yesteryear Lester Peries films. It was heartening to see well-preserved still photographs from all his productions beginning with ‘Rekawa’ – the landmark Sinhala film screened 1956. Strains of ‘Olu nelum neriya rangala’ – the popular song from ‘Rekawa’ composed by Sunil Shantha to the lyrics of Father Marcelline Jayakody – could be heard in the background, adding to the nostalgia. Display of published reviews and features of the films mainly from ‘Sarasaviya’ made the exhibition more meaningful. Being away from Sri Lanka I have not checked on the progress made on the Film and TV Archive started on the initiative of the then Director of National Archives, Dr. Saroja Wettasinghe. On that visit I picked up an interesting publication by the Department titled ‘Sri Lanka – Reflections of History’. In an introductory note, Editor Saroja W states that there are no monarchical archives of the period, 3rd BC to 11815 AD. The publication begins with the Portuguese administration in the maritime area (1520-1658) during the Kotte-Sitawaka-Kandyan periods. Although the original archives of the Portuguese administration is not in Sri Lanka, yet archives containing interactions with the Sinhala kings are available in Archives in Lisbon, Portugal and in Goa, India. The publication begins with the earliest references to Taprobane (Ceylon). The often-seen Ptolemy’s map is used in the opening page followed by a short account of Ptolemy. “An astronomer and geographer Claudius Ptolemy is a native of Egypt who carried out observations in Alexandria and published a Geography, which was a standard source of information until the 16th century. The Ptolemy system assumed that the earth was the fixed centre of the universe, with the sun, moon and stars revolving round it,” it says. 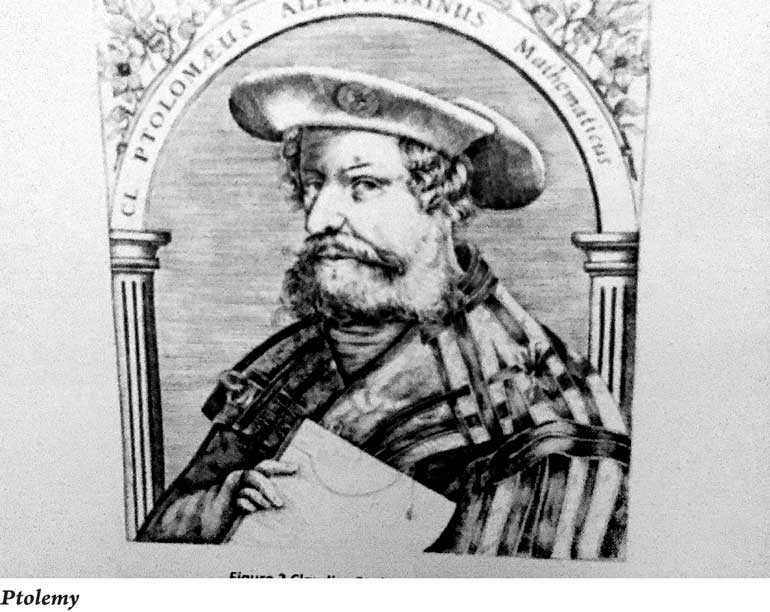 The publication carries a reference to Taprobane in the oldest printed book which was printed in the press of Johann Besicken in Rome on 7 November 1506. It is in Latin with thick Gothic lettering. Only three copies are known to exist – in the British library (formerly British Museum), the library of the Royal Society of England, and the Bibliotheque Nationale, Paris. When translated, the title reads: “The recent exploits of the Portuguese in Ethiopia, India and other eastern lands”. It is in the form of a letter from King Manuel of Portugal to Cardinal Alpedrinha conveying information supplied by Fernao Soares who had sailed back to Lisbon on 22 May 1506. It gives an account of the voyage of Don Francisco de Almeida in 1505 – his visits to the African coast and arrival in South India. In the introductory note to the Archives publication, the need for the State sector administration to transfer their valuable records regularly to the National Archives has been stressed. Apart from the fact that it is a legal requirement, it helps to effectively reflect the nation’s history in the present era, the note says.